With summer approaching fast, I thought I’d upload a painting that reminds me forever of a white summer in 2007 – it was dreamlike, washed out in brilliant light and etched in my memory for reasons known only to my heart. By now I’m a pro at painting from photos taken by my husband – my earlier posts are proof of that. I wish I could put up those photos but that’s for another kind, because I do not want your attention diverted to the original thing – selfish I am. My blog is about imitation. It’s about painting. Photography, though a form of imitation, does not fit in this space. The piece that I share with you here is a watercolour painting. I simply love the medium. I like it that I can finish an 8×10 watercolour piece within a day. It’s like churning out tasty one pot meals – easy. 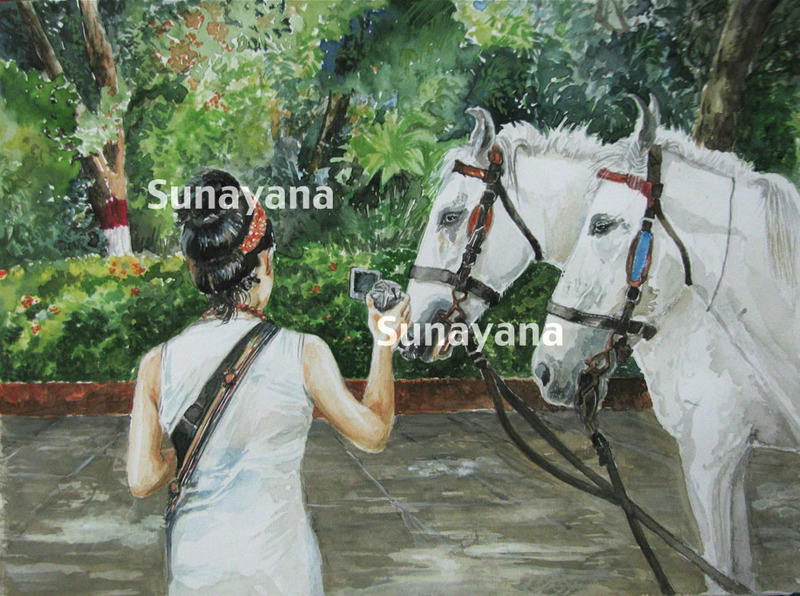 The painting shows a tourist in Mumbai photographing two white horses with one of those handy cams that you no longer see in use these days. 2007 was not long ago and yet a thing such as a handy cam seems so obsolete today. In the photograph, the caretaker’s torso is visible between the two horses with his head comically hidden behind the horse in the front. I readily omitted him due to aesthetic reasons, or it would have looked like the caretaker had a horse’s head. This is the Mumbai University campus, or somewhere around it, where you see many Victorias (a remnant of the colonial days) moving about. No longer what they used to be, these horse carriages have drawn a lot of flak lately for ill-treated and malnourished horses. Protests have been held in as far as Europe to stop the torture against these beautiful animals. And why not? They need not suffer the whims and fancies of humans. I like the top bun and bohemian outfit of this tourist. That was a joy to paint, not to mention the faces of those beautiful white horses and the greenery in the background. This is from Mumbai, to all the tourists who come to our chaotic city. Welcome! Thank you Filippa and eCharta..